Photo courtesy of the Journal of Animal Ecology. Used with permission from Blackwell Publishing. 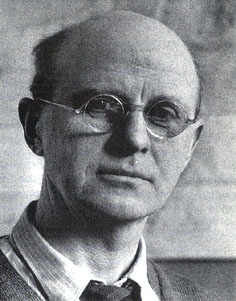 Charles Elton was among the most important and influential ecologists of the twentieth century. He rebelled early against the training emphases of his time for zoologists--in embryology and anatomy--spending any spare time he had in the field, studying life histories. In the early 1920s, while still a student at Oxford, he took part in three expeditions to the Arctic island of Spitsbergen, which experience would help shape many of his later ideas. His first important book, Animal Ecology, was published in 1927 and soon became a classic, remaining in print in later editions to this day. He became interested in the puzzle of the regular population fluctuations that characterize certain species of Northern mammals, work which led to another classic book in 1942, Voles, Mice and Lemmings: Problems in Population Dynamics. In 1958 his years of study of another important subject, biological invasions, resulted in a third influential title: The Ecology of Invasions by Animals and Plants, generally acknowledged as the cornerstone work in that field. Besides this trio of works, Elton is especially remembered for founding and for nearly twenty years editing the Journal of Animal Ecology, for his studies on animal community patterns (including the community-oriented concepts of the "Eltonian niche," and the pyramid of numbers), and for a number of contributions to economic biology and conservation studies. --born in Withington, Manchester, England, on 29 March 1900. --dies at Oxford, England, on 1 May 1991. --Oxford Dictionary of National Biography, Vol. 18 (2004). --Biographical Memoirs of Fellows of the Royal Society, Vol. 45 (1999): 131-146. --Journal of Animal Ecology, Vol. 37(1) (1968): 3-8. --Journal of Animal Ecology, Vol. 61(2) (1992): 499-502.